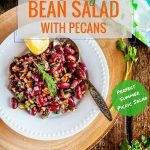 This Easy Bean Salad with Pecans is perfect for summer picnics or potlucks. It’s made only with a handful of ingredients found in your pantry but has a really bright and vibrant flavour. It’s healthy, filling, naturally gluten-free and vegan! Great for summer meal prep! This post contains amazon affiliate links which means if you purchase something after clicking on them, I’ll get a small commission. We don’t usually appreciate things until they are gone or broken… No, this is not a philosophical post about living life, enjoying every moment etc. I mean, yes, live life to the fullest, of course. I’m not denying that at all. But this is about a more trivial thing, such as a car starter. I didn’t appreciate a working car starter until it began to intermittently not working. In fact, I did not even know that there is such a thing as a car starter up until a few weeks ago. After some reflection and a few calls to my mechanic, I figured that the problem happens (intermittently) if the car was driving for 20+ minutes and got hot (like me driving it from work) and then it was stopped for 10-15 minutes (like me running an errand) and then the car got started again (like me finally trying to get home). Then it gets fun! Eventually I stopped running errands, which doesn’t sound that bad except that most of my after work errands usually include going to local grocery store and buying food. Because food is sort of kind of a little bit essential to, you know, being alive! 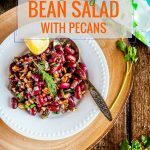 This Easy Bean Salad with Pecans is a staple in my little family for when I have no energy to cook. It comes together in a matter of minutes and requires almost no ingredients and half of them you most likely already have in your pantry. It reminds me of an old Russian joke about what can a woman make out of nothing? Out of nothing a woman can make a hat, a drama and a salad. 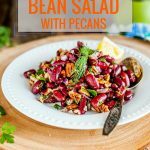 The roots of this delicious and filling Easy Bean Salad with Pecans are Georgian. In Georgian cuisine (which is very popular in Russia) beans and nuts are essential. There are endless variations on Bean and Nut salads and they are usually called Lobio. 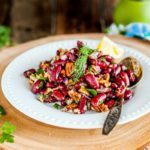 Traditionally, walnuts are used in Lobio salad and Georgian cuisine in general, but I like the mild and buttery taste of pecans in this Easy Bean Salad more. I can’t say enough good things about this Easy Bean Salad! 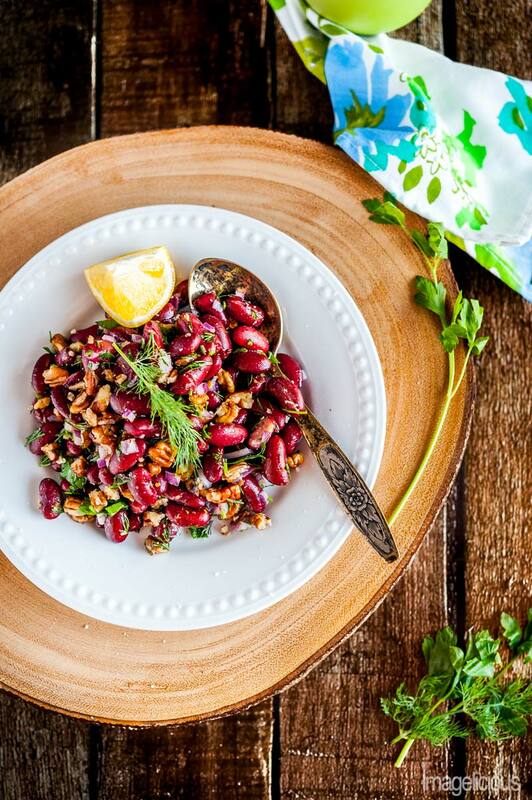 It’s super easy to make, you just drain a can of kidney beans, chop some pecans, add some chopped onion and herbs, some lemon, oil and voilà, it’s done. It’s really filling as beans and nuts provide a lot of protein. It’s healthy, it’s fresh, it’s gluten-free, it’s vegan! It’s cheap to make also! Shall I go on? I love using nuts in salads, especially Russian salads, such as my all time favourite Russian Beet Salad with Prunes and Pecans. 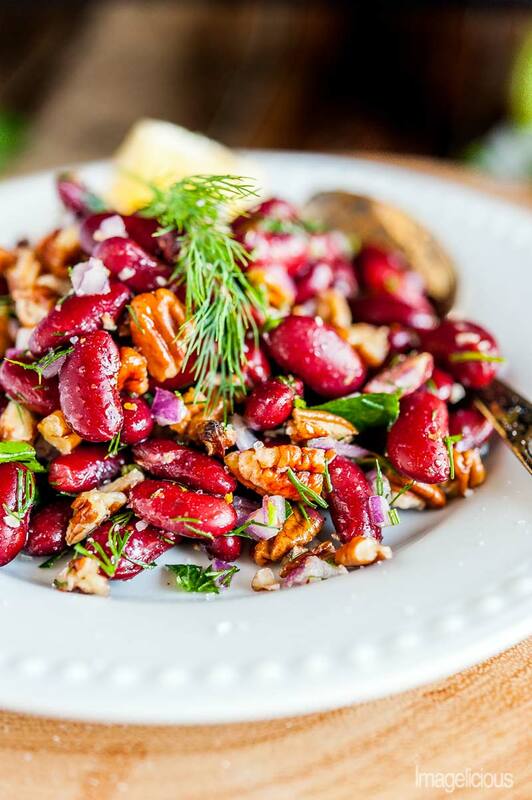 What kind of beans can you use for this Georgian Bean Salad? I prefer to use canned Red Kidney Beans. However, I’ve made this Bean Salad with White Beans, as well as with canned Bean Medley which usually includes three to six kinds of beans. The only bean I don’t like using in this salad is black bean. What other herbs to use for the Bean Salad? In this particular recipe I use half dill and half parsley but to be honest, my favourite, and the most traditional herb in Georgian Bean Salad (as well as Georgian cuisine), is cilantro. I know cilantro is not universally loved, so feel free to use either dill, or parsley, or cilantro, or mix of all of them. 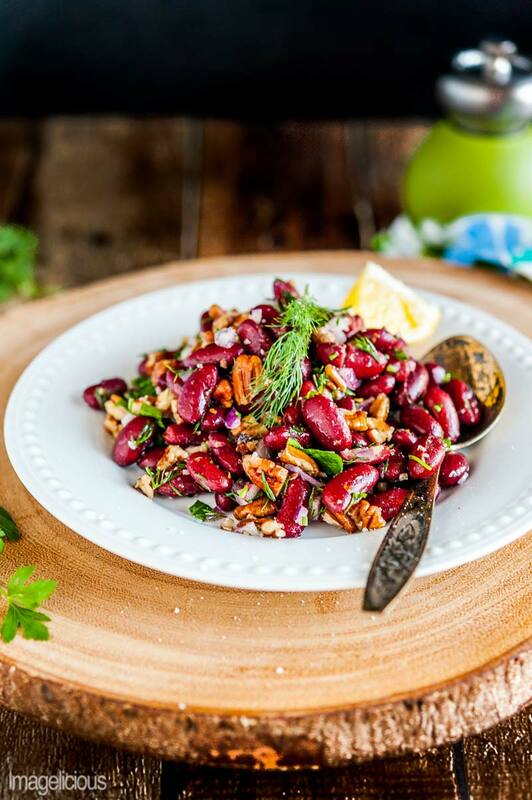 But you need to use lots of herbs as they give this Easy Bean Salad a characteristic fresh and vibrant flavour! If you are making this Bean Salad in advance for the meal prep or just a big batch, then dress the salad right before serving as oil and lemon absorb into the beans and nuts and the salad gets a bit dry the next day. Now, say this five times in a row! This Easy Bean Salad with Pecans is absolutely perfect for picnics! It has nothing that would spoil or get soggy. It essentially has just three main ingredients: beans, nuts, herbs. Onion is optional and you can even use pre-made Italian dressing if you’d like. My husband is a huge fan of all things beans and lentils any time of the year. If you don’t like using canned beans and simmering beans for hours in the summer isn’t your thing, apparently you can make beans in you Instant Pot easily. I personally haven’t tried it but it’s definitely on my list to do. Drain and rinse kidney beans. I use no salt added beans. Place the beans into a large bowl and crumble pecans on top. You can chop the nuts as well, but I find that chopping them is quite messy as they usually try to escape from the cutting board, so I just use my hands to break them into smaller pieces. Very finely chop the onion, it'll be about 1/4 cup of chopped onion, maybe a little bit less. Finely mince dill and parsley. You'll get about 2 tablespoons of each herb. Add onion and herbs to the bean and nut mixture. Squeeze some lemon juice and add a tablespoon of oil. Add seasoning to taste and mix. This goes very well with cilantro, but I know that many people don't eat cilantro and my husband is one of them, so I use other herbs. Sometimes just parsley or just dill, whatever you have on hand. You can use walnuts instead of pecans too. In fact, walnuts are the more traditional way of making this salad in Georgia. I find that pecans provide a milder flavour than walnuts which I like more. I use very little salt in my cooking and I find that lemon juice gives enough flavour and seasoning to the salad. I only used a tiny pinch of salt for this, so I can't say how much would work for you. If you are making this in advance or big batch, then dress the salad right before serving as oil and lemon absorb into the beans and nuts and salad gets a bit dry the next day. Love the look of this salad! I always have a can of red kidney beans hiding in the back of my cupboard and this would be perfect in the summer when I don’t want to use the oven. Are walnuts more traditional? I love pecans, but I think they’d be rare in Russia. Julia (my namesake 🙂 ) – yes, definitely walnuts are more traditional. I personally prefer pecans because I like their taste better as I find them milder and sweeter. Thank you! I hope you try it. It’s really good!